From the bottom shelf VHS scroungers at Intervision we have a strange Canadian thriller right here, the cover art had me hoping for some mind-melting Lucio Fucli-esque SOV weirdness, but this is not that sort of movie. It opens with Boris (Lazar Rockwood) being released from prison, having been sent to the big house after a botched robbery. He takes a nice long walk in the snow, visiting the shores of what looks like an ocean but might very well be Lake Ontario. Afterward he goes to a diner where he meets his ex-girlfriend Wendy (Bonnie Beck) who is none to pleased to see him, they argue for a bit while discussing the botched robbery that sent him to prison, for which she seemingly bares some blame. He manages to convince her to assist him in robbing her current employer, Lord Breston (Gary Freedman), a wheelchair bound millionaire who forces her to dress in skimpy maid outfits and is very hands-on apparently. Local legend has it that Breston keeps a treasure in the basement of hos mansion, so to that end the duo go to the mansion and sneak in the back door, they make their way to the lower end of the mansion and using a stolen key they gain access to a door, only to find it locks behind them. A speaker kicks on and the recorded voice of Lord Breston informing them that they have entered his home in an attempt to steal what belongs to him, now they have to face a series of puzzles/challenges in a series of six rooms, if they can solve the various puzzles and survive the traps in each room they will be rewarded with a treasure, and given the option to enter a seventh room! 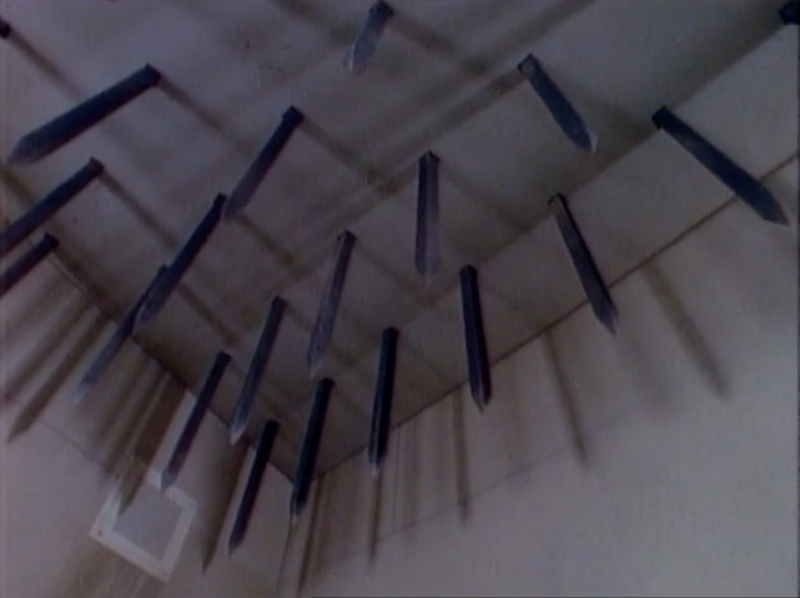 The movie is surprisingly brisk in it's paced, as the film plays out the trapped duo face each of the six rooms/challenges, these are lo-fi but sort of cool, pre-dating both Cube (1997) and Saw (2004) as a puzzle-box movie. The challenges includes solving the combination lock on a vault door, word puzzles using lettered tiles on a floor, a room armed with moving walls, another with a descending spiked ceiling, and a trapped doors and a room that fills with water. For ninety-nine percent of the movie we just follow these two around the puzzle room, and let me just say that our guy Lazar Rockwood, who plays Boris, has such a rad name, he totally sounds like he should be fronting a Faster Pussycat cover band in a dive bar on a Tuesday afternoon at 4PM. Originally from Yugoslavia the guy has a very distinct look, falling somewhere between a n even more emaciated Billy Drago and a crackhead version of Joey Belladonna from metallers Anthrax, with the same sort of mullet hair. 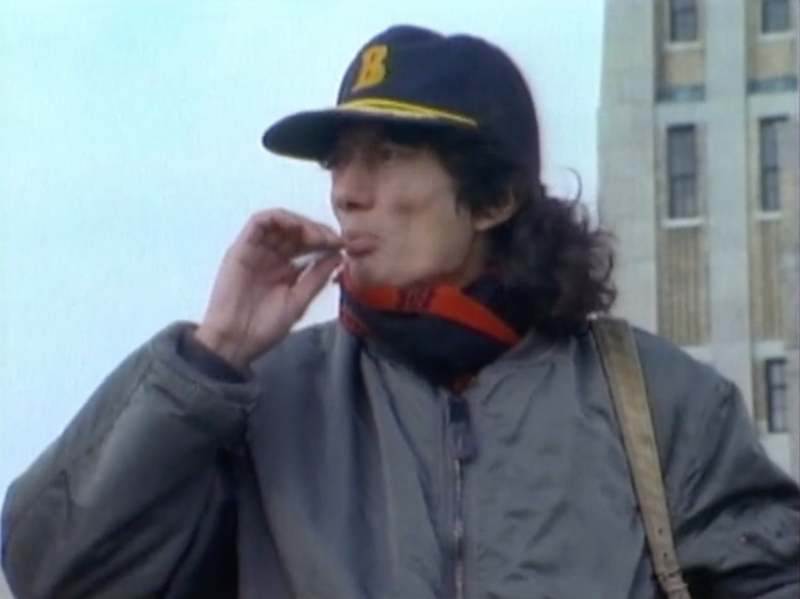 He's a chain smoking nicotine fiend, but he has a certain charm, an inept career criminal but somehow not unlikable, with the stilted/exaggerated line delivery of Tommy Wiseau of The Room (2003) - he's just a special sort of guy. Bonnie Beck (City on Panic) is good as the other half of the duo, the red head is cute and has charms, she even some decent acting chops. The movie breezes by, which is actually quite a feat for a lo-fi SOV film, even the strangest and weirdest/greatest of these lo-fi 80's shot-on-video films seems to drag but this one flew by at just 77-minutes. Perhaps straying from horror and being more of a thriller helped it in that respect. Even though it's low budget and cheap as Hell you can see that the director has some artier leanings, managing to create some claustrophobic atmosphere in the confined spaces, there's even a fun synth rock theme. The movie certainly has some quirks, the decision to get-it-on after a near drowning/hypothermia situation being just one, and a twist that begs more questions that caps of the movie being another, but these are just part of the inept charm of Beyond the Seventh Door. 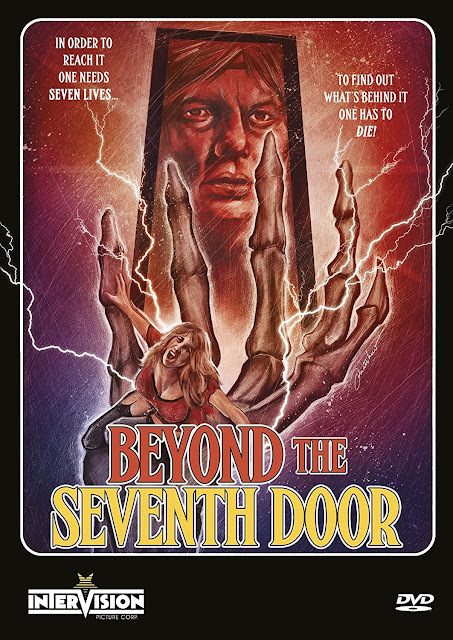 Audio/Video: Beyond the Seventh Door (1987) arrives on DVD for the very first time ever from Severin imprint Intervision Picture Corp, framed in 1.33:1 full screen, which is the original aspect ratio. The lo-fi film looks to be SOV, or at least shot on 16mm film and edited on tape, the full frame presentation is murky and looks like the VHS presentation that it is beneath that digital encode, it's not gonna look great but this is probably the best the movie will ever look on home video. Audio comes by way of an English Dolby Digital mono presentation, there are no subtitles, but for the most part everything is discernible and not too offensive. Onto the extras we get Audio Commentary with Writer/Director BD Benedikt and Actor Lazar Rockwood, moderated by Paul Corupe of Canuxploitation.com that is packed with quite a bit of information about the director, how the film came about, and the various locations used in the film and how certain traps were achieved on the low-budget movie. There are also 22-minutes worth of interview with the director and star, with the director discussing his Christian beliefs and alternate career writing Yugoslavian religious thrillers, and it looks like he currently works at a movie theater, the interview seems to be conducted while he's cleaning up around the cinema. Lazar shows up and dispenses some acting knowledge on us. There's also a nine-minute tribute to The King of Cayenne, the Toronto eccentric Ben Kerr who shows up in the film as a corpse, with local personalities and artists paying tribute to the late legend, who apparently had an affinity for cayenne infused cocktail beverages. Beyond the Seventh Door (1987) is a weird Canadian thriller, sadly there's no horror to be found here, but it is a strangely compelling and ambitious movie in a low-rent sort of way. That they made it somehow work using what looks to be the same sparse basement sets to create the puzzle rooms is commendable, but it's Lazar Rockwood who will keep you coming back for a second helping. If you're one of those weirdos that likes to seek out strange/amateur lo-fi movies from the 80's and you haven't watched this one yet head on over to www.severin-films.com and pick this up, you will definitely be disappointed, but then you're gonna make all your friends watch it too, and that's it's own twisted reward.